Women’s professional wrestling is at its peak in popularity. Women are breaking barriers and achieving goals, that would have been unheard of even a decade ago. Just last weekend, three of the top women in industry headlined WrestleMania. The world of professional wrestling is still buzzing. 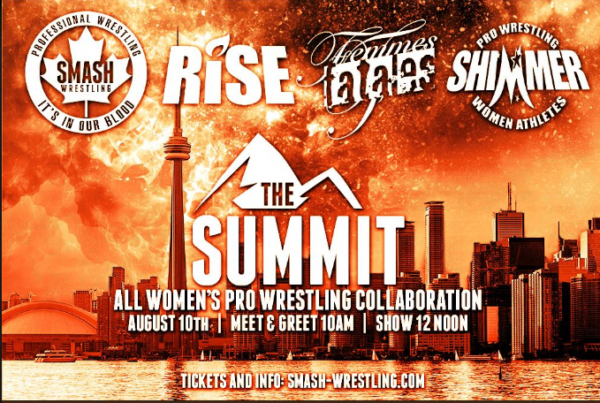 On the heels of this rise in popularity, Smash Wrestling has announced an all women’s supershow titled, The Summit. Smash Wrestling is hosting this event. They’re teaming up with U.S. based companies SHIMMER and RISE, along with Canada’s Femmes Fatales promotion. This historic event will take place right smack dab in the middle of Summerslam weekend, in Toronto at The MET – Midtown Event Theatre on Saturday, August 10TH. The official press release states the event slated to begin at 12 pm, along with a meet and greet prior at 10 am. Championships from all promotions will be defended. The audience will get to see some of the most talented women that the industry has to offer. What do you think of this historic event planned for Summerslam weekend? Leave a comment below and let us know!